Thank you for choosing the Rocky Mountain Outdoor Center where outdoor adventure is our passion. We are proud to offer professional kayak instruction in the amazing Arkansas River Valley! Our legendary paddle school has been teaching paddle sports in this area for over 30 years. All courses are taught by a qualified RMOC instructor who is certified by the American Canoe Association (ACA). Equipment provided. A great place to start as well as a good refresher for those who want to review their basic skills. We begin by covering the necessary equipment and fitting you properly in your kayak. Then we head to the lake to work on strokes, bracing, edging, posture, and an introduction to the roll. This course will give an overview of basic river hydrology and how to use river features to your advantage while in moving current. Basic moves like the eddy turn, ferry, and peel-outs are covered, as well as, how to handle small river obstacles. This is a great course for applying your flat water skills to the moving water or tuning up your basic river maneuvers. Time to head downstream and enjoy the beauty of running down a Rocky Mountain river. We will cover river running tactics as well as safety and communication. Also, we’ll look at how to read water, scout rapids and identify hazards. Plenty of time is spent on practicing basic river maneuvers as well as an introduction to surfing and playing in small river features. So you are comfortable in class II water but are looking to step up your game. This course is designed to take you there. Topics covered will be jet ferries, catching micro eddies, rolling in current, and advanced strokes. Learn how to make easy whitewater more exciting and challenging by making moves in faster current and through slalom gates. Salida or Buena Vista River park. Moderate downriver section. Lake, pool, or calm eddy. We will have a pool set up next to our tent in South Main during Paddlefest weekend. Call 719.395.3335 to sign up for a 30 minute roll session. Equipment NOT provided, but available to rent from CKS Mainstreet. Make the river your playground with freestyle tricks like cartwheels, flatspins, and loops. Super fun and a great way take your river running and roll to the next level. Equipment NOT included for Paddlefest Course, but available to rent. Proficient Class III Paddler with a solid river roll. If you are looking to start exploring your local creeks this course will help you to prepare. Techniques like boofing, catching micro eddies, and hairy ferries will be covered as well as safety concerns and group communication. Take your kayaking to the next level! Explore the Arkansas River with friends and RMOC staff. 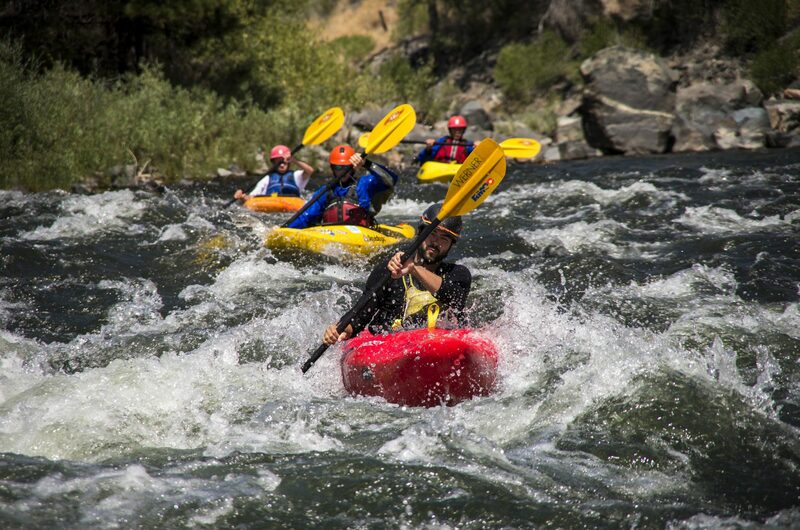 Intermediate paddlers can expect good times and professional instruction on some of the best river runs in Colorado. Expect to run Brown’s Canyon, The Fractions, and other class III sections of the Arkansas River. Playboating sessions in Salida and Buena Vista Riverparks will practice basic maneuvers like spinning and looping. Note that this course is scheduled during typical high flow periods in Colorado. This should provide an opportunity to practice big water river running and also provide excellent surfing at the river parks. Riverside camping at our beautiful private campground provided. Arkansas River. Class III and IV whitewater sections. Salida and Buena Vista river parks.